Our Parent Teacher Organization (PTO) was establish during the 2013-14 school year. 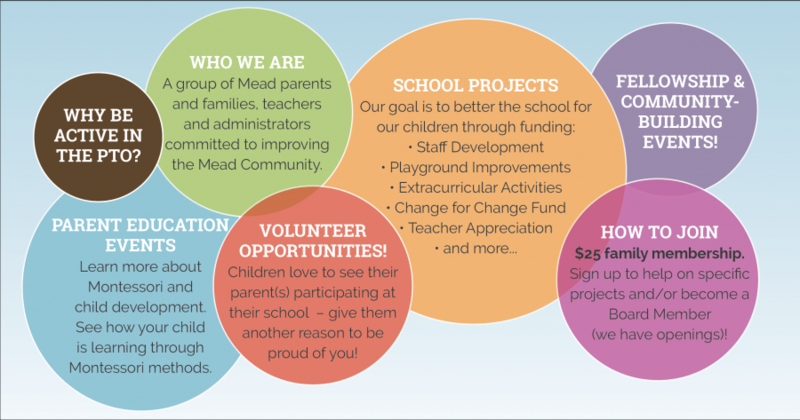 The PTO is a non-profit 501(c)(3) organization of parents/guardians, grandparents and teachers of Mead Montessori School whose goal is to foster a nurturing and caring school community that strives to build a better educational environment for our children. Through membership dues, tax-deductible donations, and fundraising efforts, the PTO will be integral in raising funds to finalize renovations on our historic school building, classroom expansions, enhancing indoor and outdoor physical environments at all campuses, purchase educational materials and equipment for the school, support teacher training and continuing education, as well as getting involved in various efforts to help the local community.